Today we feature former literary agent and freelance editor Mary Kole, who provides consulting and developmental editing services to writers of all categories and genres, working on children’s book projects from picture book to young adult, and all kinds of trade market literature, including fantasy, sci-fi, romance and memoir. Be sure to enter her giveaway for a free query letter critique. Tell us about your career and how you came to be a freelance editor. I started out in publishing as a reader for a literary agency in 2008, as I was getting my MFA in creative writing. I’d always been interested in reading and writing, and had an English degree. But the business of publishing was always calling, as much as I loved (and still love!) writing creatively. I wanted to see how books were made and marketed, and to be a part of that process. After the agency internship, I started interning in the children’s department at Chronicle Books, and the rest, as they say, is history. I found my calling in children’s literature. From there, I became a reader for the Andrea Brown Literary Agency, and then an agent. I moved to NYC in 2010 to be an agent full-time. During this time, I developed the Kidlit.com blog and wrote my book, WRITING IRRESISTIBLE KIDLIT. After an agency switch to Movable Type Management, I met my husband, and we decided to move to Minneapolis to be close to his family and start our own. Leaving NYC meant that I would leave agenting—I just didn’t think I’d be an asset to clients without having boots on the ground in Manhattan. I’m very much an in-person person when it comes to getting to know editors. So I went back to doing what I’d really developed a huge taste and talent for while agenting: working one on one with writers to strengthen their manuscripts before submission. Now that’s all I’ve been doing full time for the last five years as a freelance editor. I love it! I get to use my ideas about the craft of writing and weave in my publishing industry insider experience. 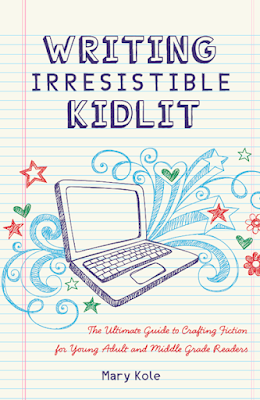 Congrats on your influential website, Kidlit.com and your book, WRITING IRRESISTIBLE KIDLIT. Tell us about them and how they came about. When I got to my first slush pile in 2008, I immediately thought, “Oh my goodness, there is so much weird and wonderful stuff here. I want to blog about it!” But, of course, it would’ve been highly unethical to share what people were submitting as their private creative work. So that idea, happily, morphed into, “Oh my goodness, writers are making so many mistakes. I should write about how to nail some of these fundamentals and help guide aspiring writers in the ins and outs of the publishing process.” A much better idea! Kidlit.com was born in 2009, once I’d decided to focus on children’s books. For a few years, I developed my writing craft philosophy and teaching style. In 2012, I got a book deal from Writer’s Digest Books. Instead of repackaging blog content, I challenged myself to write all new material about writing and publishing middle grade and young adult novels. I am so proud of the book. It was so fun to write. And I still hear from writers every week, five years later, that it’s influential and helpful to them. That’s the most gratifying part of all. What are some of the biggest changes you've seen in children's publishing since you began? Children’s publishing has really come into its own as an economic force. Lists are bigger, the market is more competitive, houses are making big money in children’s books and want that trend to continue. More and more writers are trying their hands at kidlit. The field is more crowded than ever. Writers are challenged unlike they’ve never been before to put fresh spins on familiar ideas (a kid with powers, a kid going to a school or camp for others like them, “issue books” that deal with suicide, etc.). The bar has been raised significantly for quality of writing, plotting, and character development. Basically, this is now a mature market and new entries need to perform and impress, especially if you have dreams of publishing with one of the major houses. All of these changes put a lot of pressure on the writer, and anyone in the writer’s corner, like an agent or freelance editor. I have to up my teaching and critiquing game, and really work hard to give creative, actionable input. I also have to become versed in other publishing models (like independent publishing) for my clients who either don’t want to participate in the traditional model or have burned out there. The market for editors is crowded, too, since writers have realized that they need to often hire people to help get a manuscript into shape before submission. So I have to keep my skills sharp, and market myself. I am very lucky to have a big platform and loyal client base, but I’m always working on outreach, too. As a professional editor, what are some common mistakes you see aspiring authors make? Two things come to mind immediately. The first is telling about emotions or relying on physical clichés, for example: “She was sad” or “Her heart hammered in her chest.” Neither of these are very interesting because they’re not specific. Very little writing prowess is required here and, as I mentioned above, that’s not ideal because the bar is quite high. That’s why I teach my concept of interiority (a character’s thoughts, feelings, reactions, and inner struggle). It means going deeper into the character’s experience, often by rendering thoughts on the page or writing with an eye toward emotion. For example, compare, “She was sad,” to, “This was it. No matter what, she could never go home again.” The latter is much more specific and even approaches that nebulous quality of “voice” that all agents and editors are looking for. The second mistake a lot of writers make is not researching the market or what else is being published today. Some writers will not read because they worry about polluting their own process. This attitude (ironically) tends to breed cliché ideas and cliché writing because the writer is not exposing themselves to what’s out there and what their published peers are doing. A related mistake is reading some children’s books from their own childhood in the 70s and writing more of that. The market has changed in BIG WAYS, so this is not going to be helpful. Bone up on what’s contemporary and successful. Some writers also categorically refuse to look at publishing categories because they see any discussion of commercial topics as selling out their art. They usually end up writing 10,000-word “picture books” or 5,000-word “middle grade novels”. Neither of these projects fit the category the writer is trying to pitch. Sure, you can absolutely write a manuscript that doesn’t fall into any established genre or category. You can do whatever you want. But if you don’t know the market, and you don’t write with at least a nod to market in mind, your odds of publishing such a project are precipitously low. What is ONE thing people can do to improve their middle grade or YA novels? Their picture books? Voice is crucial in middle grade and young adult. If you really want to put rocket boosters on your progress in this area, print your novel out and read it aloud. THE WHOLE THING. Yes, I realize that’s a lot and you’ll lose your voice and there are probably other people in your house who you’re self-conscious about. They will hear you. They might think you’re weird. Who cares? Read it aloud. Hold a pen in your hand and mark all the passages that are too wordy or clunky or don’t sound right. Go back and fix those, also by composing aloud. Voice isn’t just something that echoes around in your head. It must be spoken and felt in your body. For picture books, go and read 50 picture books from today’s shelves. Again, I’m serious. 50 of them. Go to a library, claim a corner, pull up a ridiculous little chair, and do it. (You don’t have to read them aloud, though if you do, you will probably find yourself running story time before long!) I can read a picture book in three minutes flat when I’m trying to expedite bedtime for my son, so this isn’t going to take you all that long. Pick only examples that are relevant to your own work (if you’re not writing a nonfiction science picture book, you probably don’t need to read any at this point). Pick only those published in the last three years. Sit and read. Stretch your legs when the ridiculous chair gets to be too much. Then read some more. You are looking to get a sense of character and plot and voice. Notice how they all have conflict. That’s one thing missing in a lot of picture book manuscripts. Notice how character is established. If you’re like most people, you’ll be shocked to notice that picture books have gotten really incredible since the last time you looked. This is often new information that I wish a lot of aspiring picture book writers had before deciding to hammer out a draft. I tend to be an open book (har har, bad publishing joke) for the most part. But because I share so freely and seem effusive when doing webinars and conferences and public speaking (in my agenting days, that sometimes meant one or two conference weekends a month, giving keynotes to hundreds of people), many people assume I’m an extrovert. I used to assume this, too, because there are elements of teaching and interacting with people that I really love. However, I’ve come to realize that I really do value my alone time. I love what I do, I love the focus it demands, I love to be in my head. (In a sci-fi scenario, I’d want to be a brain in a jar.) I need long periods to recharge and recalibrate after being “on” in a social setting. Working from home, which I’ve done for my entire career, is actually perfect for me. The more creative types I meet, the more I recognize kindred spirits who perform well in public, but need ample time alone to refill their gas tanks. What editorial services do you provide and where can people find you online? I offer a full menu of editorial services for writers in all categories. My specialty is children’s books, because that’s where I’ve built my expertise and brand, but about 30% of my clients write general fiction (literary and genre), memoir, and nonfiction. I’ve been doing a ton of memoirs recently, actually, and I love them. Fiction principles still apply to narrative nonfiction storytelling. I’m happy to work on WIP novels in outline form, or on completed manuscripts, everything from picture books to sprawling genre sagas. Most of my services include in-depth written feedback on the page (I specialize as a developmental and line editor, instead of simply a proofreader or copy editor, though proofreading services are included on every project). But I also love working with published authors in an advisory capacity, so I offer phone overview and consulting services, too. Basically, whether you’re a rank beginner or a mid-career author, whether you’ve finished a draft for the first time or finally trying to break through your obstacles and land an agent, I have a service for you. Even if you can’t find an appropriate option listed, we’ll create one together. Find out more at www.marykole.com. Former literary agent Mary Kole provides consulting and developmental editing servicesto writers of all categories and genres, working on children’s book projects from picture book to young adult, and all kinds of trade market literature, including fantasy, sci-fi, romance and memoir. 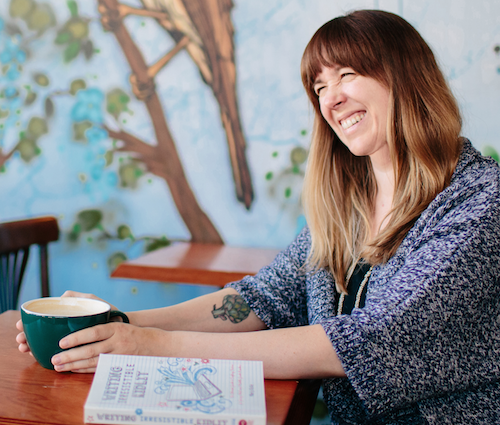 She holds an MFA in Creative Writing from the University of San Francisco and has worked at Chronicle Books, the Andrea Brown Literary Agency, and Movable Type Management. She has been blogging at Kidlit.com since 2009. 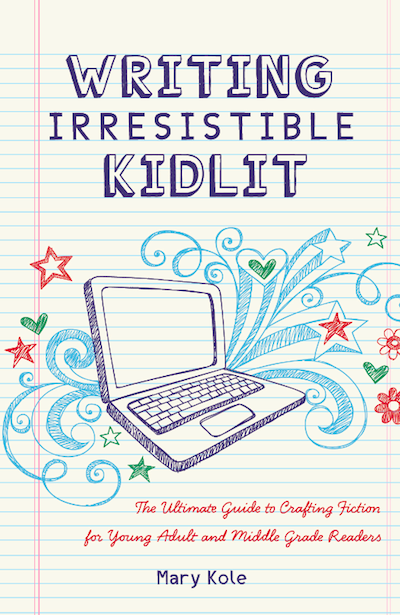 Her book, Writing Irresistible Kidlit, a writing reference guide for middle grade and young adult writers, is available from Writer's Digest Books. A San Francisco Bay Area native, Mary lives in Minneapolis with her husband, son, two noisy pugs, and a very cuddly cat. Back when lots of writers blogged, I read all of Mary's posts. This was a fun interview to read. Thank you! Top advice on writing emotions. Mary's book sounds wonderful. I'd adore a critique from Mary, I have heard great things. Great advice. Things are definitely different than in the 70's, lol. I'm very glad to know about Mary's work, thanks. (I'm writing a MG memoir...) Also had to laugh, because my high school sci-fi and world religions teacher (yes, that was a class), always said he wished he could be just a brain in a jar. But I think he mostly wanted to curb his Cheeto addiction. Wonderful interview! I love your book and refer to it often! Great interview. I'll have to look your book up. Have you written anything for the PB writer? Great interview! Glad to "meet" you! Author Naomi Hughes have unique just because of her unique talent actually I am Economics Essay Writing provider that’s why I know about her and her writing skill. I've enjoyed Mary's book and refer to it often. Wonderful resource! Thanks for the informative interview. Mary has helped me with a manuscript over the course of the last year. She is incredibly knowledgeable and helped me gain focus and submit a much sharper manuscript to agents. I just put Writing Irresistible Kidlit on hold at my local library. Great interview, and I was already a fan of the book! It's great to read about your work. Best wishes on helping writers fine tune those manuscripts! Thank you for the opportunity! I've attended two of Mary Cole's webinars. I watched them a few times to get my notes right. It was so full of valuable information that I had to stop every 2-min. to put her tips in writing. It took me a couple hours to finish one seminar :) She was very thorough! So I'd love to get a chance to show her my query letters. 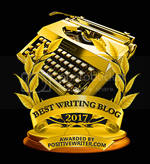 I found Mary Kole's blog when I decided to get serious about writing. It, along with her book, were very helpful. A query critique would be quite timely.